Out of our two Vale of Lorton holidays this is the one for the walker with more time, covering the route in 5 days. This walk offers great views over a reasonable timeframe. Your first day of walking begins in Whinlatter Forest Park which straddles Whinlatter Pass, between Bassenthwaite and Lorton – you will be taken here by taxi. Starting at the top of the pass the first day is nearly all downhill! Using forest, field and fell side tracks the route makes its way to the Lakeland village of Lorton which is today’s destination. Continuing downhill you will notice the beautiful views across Crummock Water and Loweswater to the Buttermere fells. The route then skirts along the base of Grassmoor before crossing the end of Crummock water and on to the night’s stop in the hamlet of Loweswater. Today you will walk through the remote valley of Mosedale before returning to the shores of Crummock water to another quiet Lakeland hamlet of Buttermere, situated under the higher fells, between the lakes of Crummock and Buttermere – today’s destination. Day 4 involves the only significant climb of the trip, as the route climbs out of Buttermere and back towards Keswick. It climbs around 200m (650ft) on well defined paths over the fell sides. Once the pass is reached, the path drops down again to the peaceful Newlands valley. From the Newlands valley the route meanders on before skirting the slopes of Catbells, en-route for Keswick and the end of this walk. The Vale of Lorton walk is a pretty, gentle walk by Lake District standards, generally on good paths, and with only moderate ascents and descents. The distances covered each day are short, giving you time to enjoy the landscape along the way. 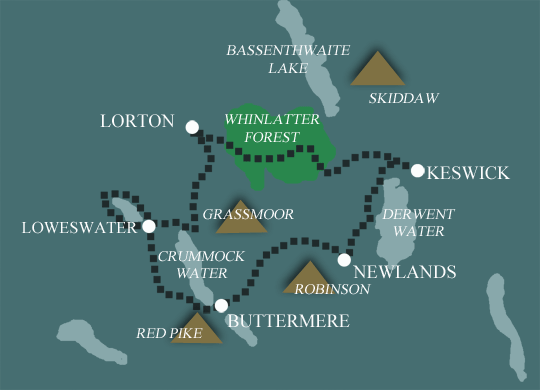 Terrain: A mixture of forest paths, wooded lake shores and tracks following the lower slopes of the fells, with one (fairly low) mountain pass between Buttermere and Newlands. What’s it like underfoot? The paths and tracks that are followed on this route are well defined and maintained. There is a short section between Buttermere and Newlands where the path, while still well defined, becomes rougher as it crosses steeper ground. How Much Up & Down? Not too much for a Lakeland walk. There is around 200m (700ft) between Loweswater and Buttermere, and 350m (1200ft) between Buttermere and Crummock, but much less on the other days. Signposting: None – this is one of our own routes. You will need to use you route description and map. Navigation: Not too difficult – the paths are well defined, but you will need to read a map and use the route description. A detailed description setting out your route. Maps An Ordnance Survey Explorer (1:25000) maps covering the entire route. General travel information for the Vale of Lorton area will be in your holiday pack including train and bus timetables where available. By Air: The nearest international airports are Manchester (MAN) or Newcastle (NCL). You can travel by train to Penrith (approx 2 hours from both) and then bus or taxi to Keswick (18 miles). By Public Transport: Keswick’s nearest railway station is Penrith (PNR). You can travel on one of the regular buses to Keswick, or by taxi (18 miles). Keswick has a central bus station, and you are usually no longer than a 5/10minute stroll to your accommodation, or a couple of minutes in a taxi. By Road: Keswick is in the Northern Lake District in the county of Cumbria. The A66 passes right along the edge of the town, and the nearest motorway is the M6. By Public Transport: Travel by bus from Keswick to either Penrith railway station (18 miles) or the larger station in Carlisle (37 miles).